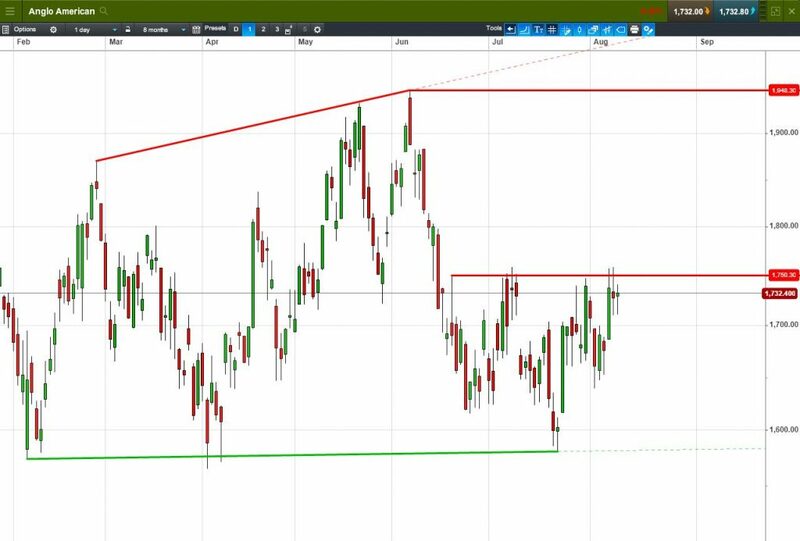 Anglo American and Glencore are two of the most sought-after Mining stocks and many investors are eager to learn more about their potential support and resistance levels, whether they trade reliable ranges and how much upside/downside potential they might have in the short-to-medium timeframe. Both stocks are 10-20% off their 2018 highs, opening the door for potentially interesting rebounds. But is there danger lurking for investors if the shares continue falling? Where are the main pitfalls for both Anglo American and Glencore? Anglo American shares recently enjoyed a strong bounce, recovering more than half of the fall from 2018 highs to 2018 lows, leaving Glencore temporarily behind. Glencore shares may be lagging its peer, but its recent price movement could open a door for an even bigger rebound. 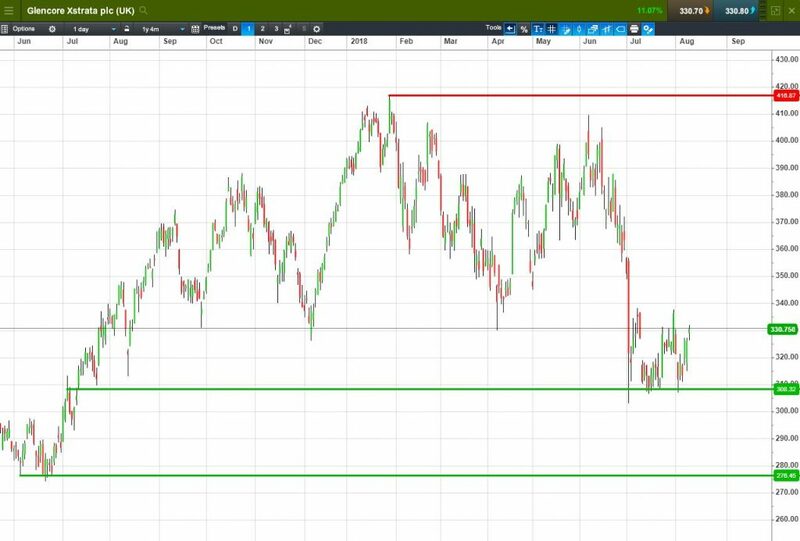 The following report goes in-depth on the main drivers that move both these shares and takes a close look at their charts to find support and resistance levels that could be useful to identify key buy and sell signals. Here we unpack the complexities of the two big Miners to help investors get a clearer picture of the business environment and potential tradable opportunities. All that is left after reading the report is to pick up the phone, call your Accendo Markets broker and discuss your investment options with confidence. But first, a short primer for those who are familiar with the two companies in this report, but want to learn more about their position and significance within the Mining sector. Glencore is a globally-diversified developer of natural resources, headquartered in Switzerland. Originally a commodities trading company, it now produces copper (57% of revenues), zinc (28%), nickel (8%) and ferroalloys (7%). It is also a major seller of precious metals, as well as cobalt (crucial for Electric Vehicle manufacturing). Most of Glencore assets are in Sub-Saharan Africa (DRC, Zambia), South America (Chile, Peru), Canada, Norway and Australia. Its key industry peer and competitor Anglo American is a major producer of diamonds (through its world-famous De Beers subsidiary, making up 21% of revenues), as well as metallurgical and thermal coal (29%), iron ore (14%) and copper (13%), plus other products. Mining sector as a whole has seen some exciting trading activity in 2018, with significant daily share price swings. US Dollar staged a strong rally against major peers, with EUR/USD falling from the highs of 1.255 in mid-February to 1.16 in early August (7.5% fall). USD rally is caused, in part, by Federal Reserve policy of raising interest rates, and new import tariffs on Chinese & EU goods, which benefit US producers. As metals are priced in US dollars, stronger USD led to lower metals prices and lower earnings for FTSE Miners. On the individual front, both Glencore and Anglo American also faced their own challenges and triumphs. Latest Anglo American H1 results (26 July) pleased investors, with EBITDA growing 11% YoY (beating consensus expectations), copper production +19%, metallurgical coal +17%, diamonds +8%. Dividend was increased by 2%, while full-year production outlook was reiterated for diamonds, nickel & coal, increased for platinum, though lowered for iron ore.
Latest Glencore results (8 August), however, disappointed, with H1 EBITDA at the lower end of consensus expectations, unchanged dividend and reported volatile price environment. Rising costs were partially blamed for the forecast miss. Legal issues continue to provide additional drag to Glencore’s share price, including the ongoing US Department of Justice investigation into bribery and money laundering, with the shares falling over 8% on the day of the announcement (3 July). New mining code in the Democratic Republic of Congo, where Glencore has important operations, is also a source of continued dispute due to higher new taxes levied on the company. For daily analytical coverage of the Mining sector and other FTSE 100 stocks, you can also sign up to have our research sent directly to your inbox. Ultimately, investors who are interested in Mining sector ask themselves whether they should pick between Anglo American and Glencore or invest a part of the account into each stock to hedge their bets. Despite their similarities, the two companies present very different trading opportunities in 2018. Both stocks have reached a multi-year peak in 2018, but Glencore achieved this level (416.9p) at the end of January and has been on the downtrend ever since. Glencore shares are now down over 21% from 2018 peak. Anglo American shares, however, reached their 2018 peak of 1948p in early June and currently down just ~10% from those highs. People interested in the Mining sector often want to personally benefit from share price volatility by buying or selling company stock. But trading shares directly can sometimes tie up large amounts of capital. One way to take advantage of the opportunities presented by share price movement of FTSE 100 Miners, by using just 20% of the full value of the position, is to use products called CFDs. If you want to invest £10,000 into Anglo American or Glencore shares, you can use leverage to maximise your capital’s full potential. If you decide to buy 578 shares in Anglo American at 1729.60p using CFDs, you only need to use around £2,000 (20% margin) instead of the full £10,000 value. 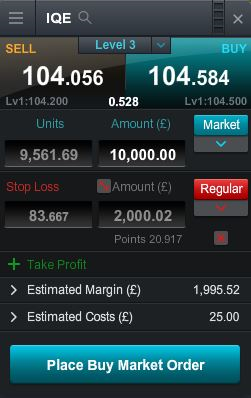 The remaining £8,000 can sits on your trading account, either as extra safety buffer for this trade or for other trading opportunities that might catch your eye. On top of that, CFD investors don’t have to pay the 0.5% stamp duty, while receiving many of the same benefits as shareholders, including dividends. 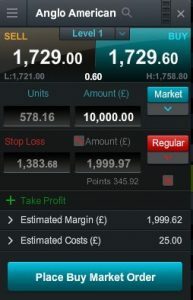 By entering a £10,000 long position with CFDs, you are assuming that that the shares will go up. If Anglo American shares went all the way back to the 2018 high of 1948p (+12.6%), you would have made a profit of £1,266 (before commission and overnight financing costs), or a 63% return on your initial investment. However, if shares instead fell back to the late-July low of 1581p (-8.6%), this would represent a loss of around £856, or a 57% decline of initial outlays. 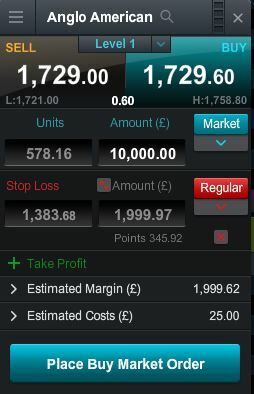 Keep in mind that with CFDs, you can never lose more than the full value of your initial 20%/£2,000 deposit. On the next two pages, we discuss share price performance of both stocks in more detail. Do you already have an opinion on where Anglo American or Glencore shares will go? Get in touch with one of our brokers to discuss your options. Example of a notional deal ticket. After reaching a peak of 1948p on 7 June, Anglo American shares have seen a sharp fall in mid-June, followed by a rebound from the support level of 1580p. Shares have touched this support level six times since the beginning of the year. More recently, shares have started trading in a range, touching the resistance level around 1750p six times since late June. Will Anglo American return to June highs of 1948p (+16.5%) or fall to July lows of 1580p (-5.5%)? Downtrend in June on the back of global trade war concerns. Trading in a 1580-1750p range in July. MACD still negative, but moving higher (moderately bullish signal). Momentum is getting stronger (supporting the uptrend). 200-day Moving Average support around 1654p. Pricing data sourced from Bloomberg on 9 August 2018. Please contact us for a full, up to date rundown. Glencore reached a peak of 416.9p on 29 January after a prolonged December rally that mirrored other Miners, but the uptrend stalled and lost strength in Q1 2018. On 3 July, Glencore share price fell 8.1% on the news of a US department of Justice investigation of money laundering activity in Africa and Latin America. Company shares then found a support around the 308p level, bouncing from it six times in July-August period. Since then, shares have been trading in a narrow range. Will Glencore return to 2018 highs of 416p (+32.5%) or fall to June 2017 lows of 275p (-12.4%)? Sharp fall in July following announcement of US investigation into company. Consolidation around July 2017 lows; trading in a 308-337p range. Stochastics indicator breaking below MACD (a bearish sign). Bearish cross by Directional Indicators.